A global climate pact to reduce potent greenhouse gases set to skyrocket in the developing world is on ice following the exit of a key White House aide. The Kigali Amendment, which has split parts of the Trump administration, is likely to languish now that it lacks a champion in the White House, said George David Banks, the former climate and international energy adviser to President Trump who resigned last week. A White House advocate is needed to push through the administration's departmental divisions, as Banks said U.S. EPA remains a significant stumbling block. But he also called on industry groups that support the amendment to conduct a long-needed economic analysis that Banks said is crucial to convincing Trump to send it to the Senate for ratification. "You have to have the numbers, and for us to have carried it forward, that was the only way that we were going to be able to overcome EPA's opposition," Banks said in a wide-ranging interview Friday at E&E News' office in Washington (see related story). The U.N. agreement is one of the world's most significant greenhouse gas reduction pledges. Finalized in October 2016, it would avert enough emissions from air-conditioning units and refrigerators to reduce warming by 0.5 degree Celsius (0.9 degree Fahrenheit) by 2100 by phasing out short-lived climate pollutants known as hydrofluorocarbons (HFCs). While the State Department supports the amendment, U.S. EPA has pushed back. EPA's role over the deal's fate grew last year when a federal court vacated an agency rule — devised under former President Obama and defended in court by the Trump administration — regulating HFCs. While there's disagreement over whether EPA still possesses the authority to regulate HFCs, that agency hasn't itself made the case for regulation (Greenwire, Aug. 8, 2017). "The EPA has got concerns about the regulatory overreach; they've got concerns about implementation, is there existing regulatory authority, do you need legislation?" Banks said. "And on that front, the ball is in their court with the existing regulatory piece." EPA didn't return an email requesting comment. Some movement is building in Congress. On Friday, Sen. John Kennedy (R-La.) introduced bipartisan legislation calling for EPA to ban HFCs. 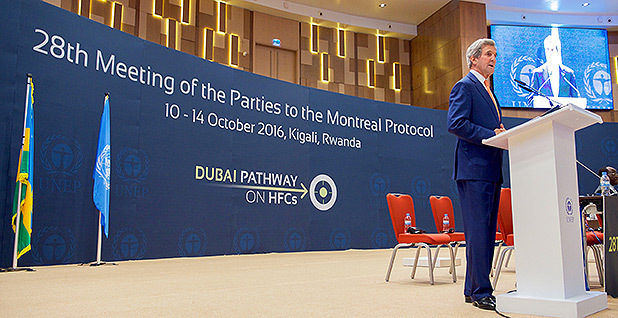 But Kigali opponents contend that the amendment perverts the underlying treaty — the Montreal Protocol — by addressing greenhouse gas pollutants. The Montreal Protocol is concerned with the stratospheric ozone layer. "We oppose ratification of Kigali just as we opposed turning a treaty dedicated to the ozone layer into a global warming treaty," said Myron Ebell, director of the Center for Energy and Environment at the Competitive Enterprise Institute. But Banks said he thinks addressing HFCs under the Montreal Protocol process is well within the bounds of fair play. After all, the non-ozone-depleting substitutes used in refrigerants to reduce damage to the ozone layer created an unanticipated problem — belching heat-trapping gases into the air. Given economic gains in emerging economies like India and China, those emissions are expected to balloon as incomes grow and affording air conditioners becomes more possible. The amendment's supporters contend that the United States stands to benefit from potentially booming global sales. They said domestic manufacturers already have a technological lead in producing the substitutes that will go into those new air-conditioning units. Absent ratification, though, they worry that the shift will come too slowly. "I think the biggest thing is just understanding both the global impacts of the treaty and how that translates to benefits for American industry," said Kevin Fay, executive director for the Alliance for Responsible Atmospheric Policy. "Our view is the market for the technologies covered by the Kigali Amendment outside the U.S. is going to double over the next decade." But that view hasn't yet been backed up by numbers, Banks argued. He said the industry "lost a year" by dallying on producing that economic analysis, which he said is now underway. "If that gets in front of the president, he's not going to care if it's a GHG, if the Obama administration supported it because it's a greenhouse gas," Banks said. "He's going to be like, 'How many jobs created? What's the impact on U.S. manufacturing, our competitiveness?' And then he'll support it," he said. "But if those numbers aren't persuasive, then it's not going to go anywhere. Including on the Hill."